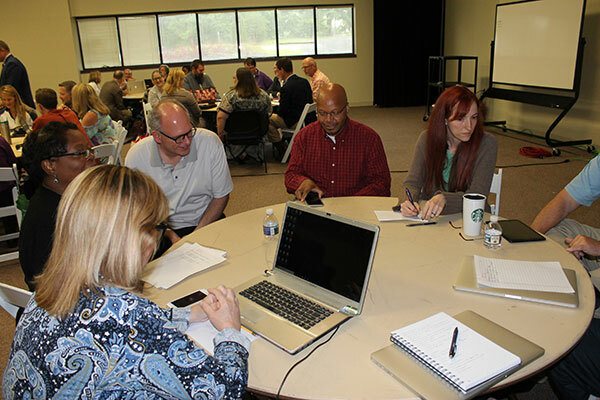 Members of the MGA faculty work with data in small groups during the 2018 MGA Data Summit. The event, organized by the Office of the Provost, was an opportunity for faculty and staff to learn new ways of analyzing and interacting with data to drive more informed decision-making. On Thursday, May 24, more than 60 members of the Middle Georgia State University (MGA) faculty and staff convened on the Macon Campus for the first MGA Data Summit. The day-long event, organized by the Office of the Provost, was designed to improve the use of data in driving decision-making processes at the University. “We have been streamlining the sources of data and encouraging its use throughout the campus,” said Jonathan Anderson, provost. During the summit, participants were provided with data sets – including enrollment information – and learned new ways to look at and analyze data as a tool for making informed decisions about academic offerings, institutional policies, and the overall direction of the University. Guidance was provided by data experts drawn from the MGA faculty and staff, and participants used laptops and mobile devices to work with data in real-time during both large- and small-group sessions.